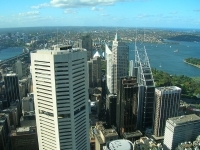 Sydney Tower, or the AMP Centrepoint Tower, is the tallest free-standing structure in the city, and one of the tallest in the country. Situated above the Centrepoint office building and shopping centre, the tower is one of the most popular tourist attractions in Sydney for its 360-degree views and Tower Skywalk platform. The observation deck is 820 feet (250m) above the city, with an enclosed viewing platform offering information on the points of interest. The Sydney Tower Skywalk platform sits above the observation deck at 853 feet (260m) above the ground, twice the height of the harbour bridge, and harnessed to the glass-floored platform, daredevils can hang out over the city far below. Check the official website listed below for ticket options. Opening times: Sydney Tower Observation Deck and OzTrek is open daily, from 9am. Closing times vary slightly according to season, with last guest entry at 9pm in summer and 8.30pm in winter. Admission: Various ticket options are available. Note that discounts are available for booking online.